STEUBENVILLE — After earning two nail-biting one-run victories to close out last week, Steubenville’s state-ranked baseball team started the new week with a little less stress. 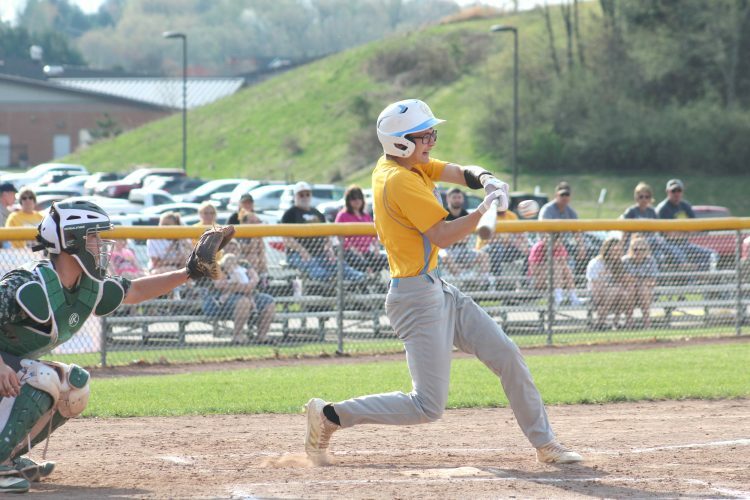 Seniors Alec Taylor and Gino Pierro drove home two runs apiece as Big Red rolled to an 8-1 victory over East Liverpool Monday at Vaccaro Field. With the victory, Fred Heatherington’s club improves to 10-2 on the season. Big Red is ranked 10th in the initial Ohio High School Baseball Coaches Association Division II poll, which was released Sunday. “It was a good game for us,” Heatherington said. “We scored enough runs to win, and we were able to get some guys in the game. The Potters, now 4-9, scored their lone run in the top of the first. Josh Recktenwald singled, advanced on Kamren Klakos’ base hit and moved to third when Cory Weyand reached on a fielder’s choice. He would score on a single by Greg Baumgarner. East Liverpool, which out-hit Steubenville 8-6, had four of its safeties in the opening frame. The visitors stranded a pair of runners in both the second and fourth innings. Big Red took the lead for good in the home half of the inning. Pierro got things started when he tripled to center. Taylor, the Ohio State University recruit, then went yard, sending a Derek Klein pitch over the fence in right center. Johnny Agresta’s sacrifice fly made it 3-1 in the third. Antonio Fuscardo, Carlo Biasi and Pierro all had an RBI in the fourth. Pierro and Ty Arlesic drove home runs in the Steubenville sixth. Klein, a freshman, worked five innings in absorbing the loss. He scattered six hits but issued six free passes. Four Big Red batters earning walks would eventually score. “We’ve been working with him on a little sidearm delivery, just to throw some hitters off,” May said of Klein. “He doesn’t throw real hard, but he throws a lot of strikes and that’s what we are looking for. Baumgarner came on to pitch the sixth and fanned the only two Big Red hitters he faced. Junior Dylan Cunningham started on the hill for Big Red and earned the win. He worked five innings. Fellow junior Ethan Duggan pitched the sixth and seventh. “Dylan is going to give up hits because he throws strikes and is always around the strike zone,” Heatherington said. “Ethan came in and did a good job. That was his first time on the mound this season. He had control of two pitches and gave us a solid effort. Pierro led Big Red at the plate with his triple and single. 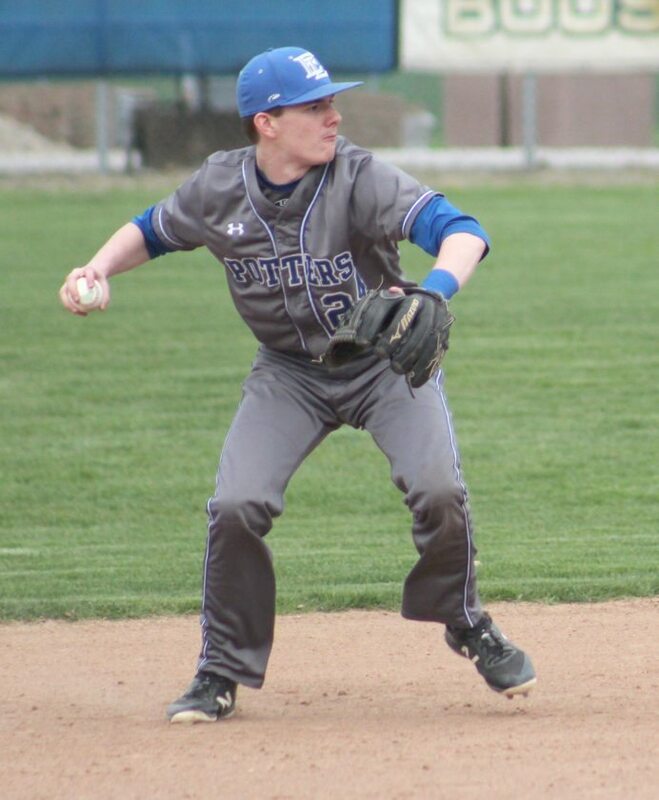 Recktenwald, Logan Torma and Connor Bailey had two hits each for the Potters, who are scheduled to entertain Brooke today. Big Red is idle until Wednesday when Harrison Central visits Vaccaro Field. EL–Derek Klein, lp (5 1/3IP, 7R, 6ER, 6H, 6BB, 1HBP), Greg Baumgarner (2/3IP, OR, OH, 2K) and Kamren Klakos. ST–Cunningham (WP, 5IP, 1R, 1ER, 7H, 1K) Duggan (2IP, 0R, 1H, 2K, 1BB) and Criss.